Member login: Forgot your password? September was a big month for the industry and Estate Living. The Association of Residential Communities (ARC) conference at Serengeti Estates in Johannesburg, facilitated 150 community managers, international community managers and key service providers were the group tackled challenges which the community face, to collectively find solutions. The core themes of the conference were communication, collaboration, adaptation and technology to drive efficiency, save time and resources. 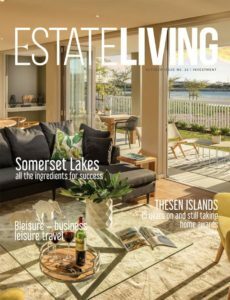 Estate Living launched the 5th edition of the annual Residential Estate Industry Journal – the best practice guide to the industry for both community management and their boards of directors. To Subscribe to the Journal for your board, please email Jaime@estate-living.co.za. In October, we look at property investment opportunities and the different ways to package your investments. From hotel apartments to student accommodation or retirement properties that allow you to buy at today’s prices give you a good income for a few decades, and potentially a future home. And there’s a lot more to investment than buying into a development that looks good. How well is the development run, does it follow best practice policies and have fair rules. Is there a long-term vision for the development and does the board of trustees support this vision and the community management team who drives the vision? Estate Living continues to share the expertise of industry leaders, giving you insight into residential community living, through our website and our newly launched official YouTube Channel – where you can experience our beautiful communities. The October edition is now available at your estates. © Copyright . The Association of Residential Communities (ARC). All rights are reserved.